Hold on to your walker. 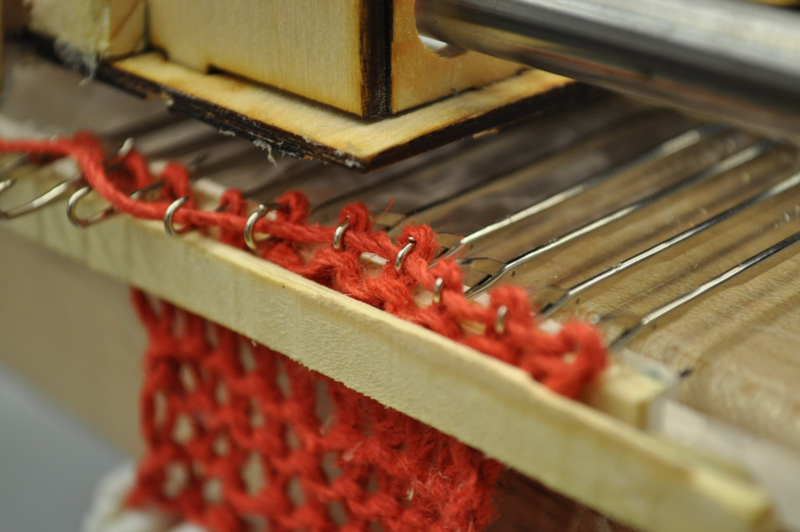 The machine can knit a small, multiple row sample. After the lack of productivity in previous sprint, we decided to move to have sprint task distributed into have sprint intervals (aka one week tasks instead of two week tasks) . Sprint 3a Goal: Each member of the team has made 1-2 improvements to the cam/needle system. Needle bed and cam now play well together. Stitches can be hand actuated and will work as such. Sensor code now functional. Motor attachment slightly less janky, but not by much. Tensioner not working. Needles don't move out quite far enough to complete stitches automatically. Two-sided verge added to hold fabric in place during knitting. It features everything this site has and more! "What more could it possibly have?" you might ask. Well, the answer is simple: a redirect! That's right, that URL redirects directly to this website. One small step for us, one minuscule step for mankind. The old encoder was the black and white paper that the sensor used to figure out how far it had gone. We want a slightly more formal build, hopefully with a greater difference between the light and dark values to make thresholding easier. The clear acrylic has very little light reflection and as such as the "dark" strip. The black electrical tape strip is shiny and reflective and acts like the white or mirror like surface. Irony. You may notice that a first attempt at a project overview page has been made. Not this will not be the final iteration of the page and it will change, likely without notification. 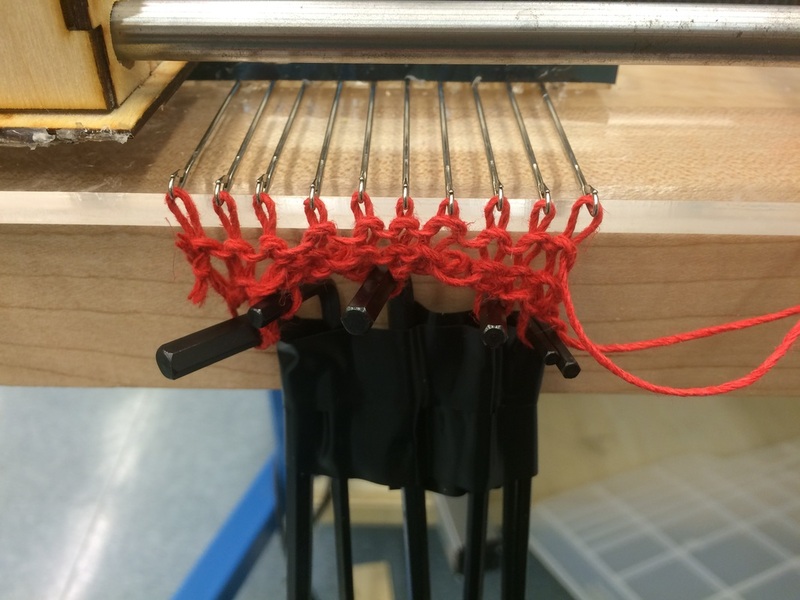 In the future, the page with hopefully include a gif of stitch actuation, more description how knitting machines exist and how they function, and links our final post, cad files, BOM, and github account. Bridges are attached over the channel of the linear cam to increase the stability of the cam. Bridges must be high enough to not block follower motion. Originally the wood of the cam was unconstrained except at the edges. 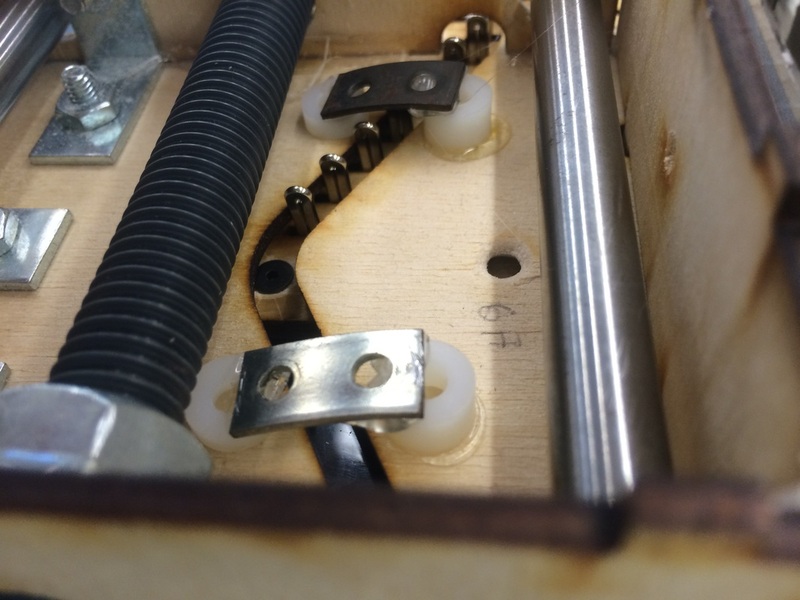 When the cam moved over the needles, the middle of the cam was able to be forced upward by the needles causing an downward force on the needles. are constrained on the front. 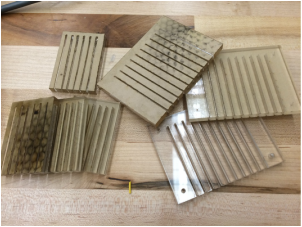 Aubrey and Sean laser cut several test beds with differing slot sizes to try to find a slot size that would allow for the cam have a moderately steep angle and to hold the needles upright in their slots. This took quite a bit of iteration, but we finally have the perfect slot sizes for the needles in the needle bed. This has eliminated the jamming mentioned above entirely. Bushing-style rollers have been added to the needle cam followers. Rollers are stable enough to handle pressure without deformation. Rollers are smaller than cam channel to allow for motion through channel. Attempt was made to find bushings to fit on the cam followers. This task was made difficult by the need for the inner diameter to be larger than 4mm (size of followers) but the outside diameter needed to be smaller than 5mm (size of the needle channel). Claire tried several materials to try to decrease friction between the cam and followers. First hot glue hut it create too thick a coat and hat to be peeled off. In order to cast off yarn during stitch actuation, the fabric of hte scarf needs to be in tension downward. This is normally done by adding a weighted comb to the fabric after a couple rows have been knit. Joe 3D printed the comb in PLA. The tension is a bit too high, but we will iterate. Knitting works better just using the yarn guide or laid by hand. To increase latch cleanse, we cut off about 7mm of the verge. While this allowed the yarn to clear the latch, the yarn no longer moved completely of the head of the needle. We desire to have a knitting machine that is stable enough to create a multiple row knitted sample without mistake, repeatedly. The trade-off is less features. We still have not met our minimum viable product going into the final sprint, which is bad. 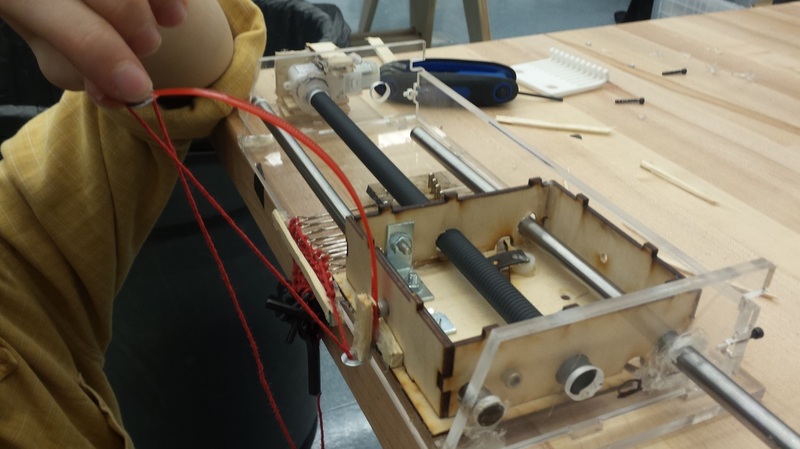 We wanted to build a 20-30 needle version, but our 10 needle version is not yet functional. It needs to become functional very, very soon. The biggest risk is sacrificing time on the smaller machine for the larger one might bite us when we try and fix everything. ​Let's do this. We have one sprint to go, and we have to make our project work at all costs. We've gotten out many of the kinks, but there is still plenty to fix. Our plan is to divide and conquer in teams rather than individually, splitting into two groups so we can tackle the remaining problems faster.